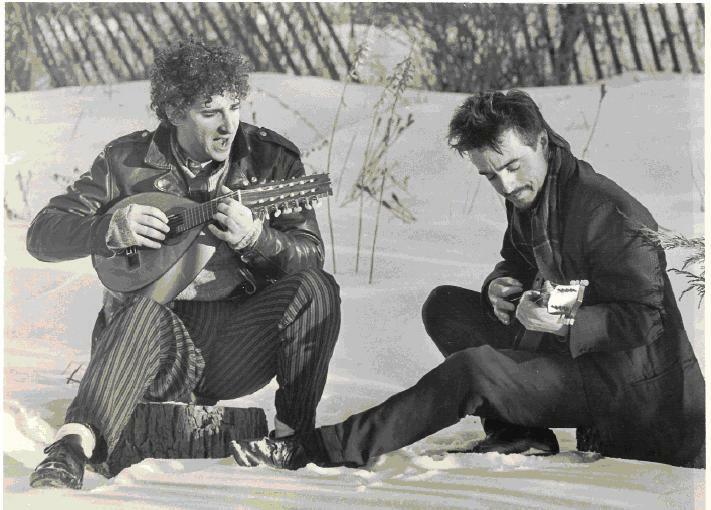 Formed by Mark Dery and Darren Smith in 1985, Bite the Wax Tadpole sprang from the homebrew cassette revolution and Manhattan’s downtown music scene. Although BTWT played East Village art-club gigs (with Sophie B. Hawkins on drums), the group mostly toured Smith’s Jersey City bedroom, recording songs on a four-track tape deck. This was music made by men in small rooms, with all the twitchy-eyed intensity that implies. Smith, a virtuoso who had studied South Indian vocal music, Balinese gamelan, and electric banjo (with Peter Tork of The Monkees! ), proved an ideal foil for Dery, a chronic word-aholic whose spoken-word performances were somewhere between William S. Burroughs’s deadpan monologues and Jack Nicholson’s scenery-chewing rants in The Shining. The landmarks on Smith’s mental map ranged from Bartok to Bollywood, Ice Cube to Meredith Monk; Dery’s influences were the Killer B’s—Burroughs, Bowles, and Ballard. Together, the pair made music full of dark humor and quantum weirdness, with a dream logic all its own. The group’s indie-label releases on the cassette-only Sound of Pig label garnered college-radio airplay and critical accolades. Darren has since gone on to pursue a career in composing for the stage and screen. Repo! The Genetic Opera!, a Blade Runner-meets-Rocky Horror rock musical directed by Darren Lynn Bousman and based on a play written and composed by Smith and Terrance Zdunich, is scheduled for release on April 25, 2008. Bite the Wax Tadpole’s new CD, Turn Me On, Dead Man—the title is taken from the backwards phrase in The Beatles’ “Revolution 9”—anthologizes the best of the band’s early years, from 1985-1992. Recorded by hip-hop/new music engineer Yoram Vazan and post-produced by downtown NYC composer/guitarist Elliott Sharp, the 17-song CD features cameos by new music/alt.rock scenemakers such as Samm Bennett and Yuval Gabay.